Golf is not a very rebellious pastime. You could even say it’s a hallmark of The Establishment, given its popularity with businessmen who make all their important decisions on the golf course rather than in the boardroom. But, especially as I’ve neared the end of my fourth decade, I’ve become more interested in following the major championships, despite having zero ability at swinging a golf club myself. And I’ll also keep track of the Ryder Cup when it’s held every two years – as it just has been, at the end of September. And it gave me an idea. Three years ago, in an Ashes-themed Ogg-Cast, I decided to pit the very best bands from England against their counterparts from Australia in a battle of the genres, cunningly disguised as Test Matches. So why not do it again, in the style of the Ryder Cup, where the net is cast wider? 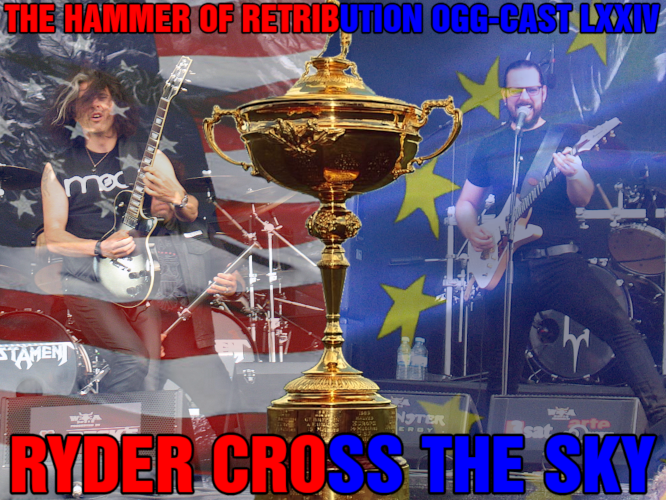 The very best from the whole of Europe will now compete against America, for the Hammer Of Retribution Ryder Cup – and you can play along yourselves if you keep a scorecard and send it to me after the show; call it a competition of sorts in which you can win something… not awful. And yes, I know the title of this episode is a dreadful pun that Martin Walkyier would have been proud of. That was deliberate. In Part One, we start with doubles matches in 80s thrash, death metal and stoner rock, with a singles match of cover versions. In Part Two, after a brief interlude to review 2013’s reissued Ogg-Casts, there are two more doubles matches, involving neofolk (courtesy of Lennard) and black metal. And in Part Three, some more idiosyncratic singles matches, which are: overt displays of patriotism, 21st Century trad metal, traditional folk songs… and the Big Finale!